Operating in a uniquely stable manufacturing environment – Optical Surfaces Ltd has established itself as a leading international supplier of Fabry-Perot etalons in a range of shapes and sizes up to 150mm in diameter with matching accuracies to lambda /300. Etalon manufacture places extreme demands on a company’s production capabilities. Material purity, optical figure, plate parallelism, plus surface, spacer and coating quality are all critical to the overall performance of an etalon. 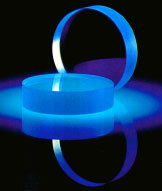 Etalons are widely used in telecommunications, lasers and spectroscopic applications to measure the wavelength of light. Recent advances in fabrication technique allow the creation of very precisely tuneable Fabry-Pérot interferometers. Fabry Perot etalons are available from Optical Surfaces Ltd in two basic forms – air-spaced or solid. Designed for use at customer-defined wavelengths within the range 190nm to about 2 microns – OSL etalons are supplied with wedge angles of 5 min of arc for smaller diameters, rising in steps to a wedge angle of 40 min of arc for diameters greater than 70 mm. Available as standard in materials including UV grade Silica and Germanium – Optical Surfaces is a preferred supply partner for etalons to some of the world’s leading research institutes as well to a growing number of laser and interferometer manufacturers. Optical Surfaces ISO 9001-2000 approved manufacturing facility provides the flexible resources to supply from single specialist requirements to OEM quantities. Benefiting from its stable environment, quality testing becomes quantifiable and reliable. All Fabry-Perot etalons produced by Optical Surfaces Ltd are provided with a complete interferometric quality test assurance report. For further information on ultra high precision etalons please contact Optical Surfaces Ltd. by telephone on +44-208-668-6126 or via email sales@optsurf.com.